He's now Classic, Rapid and Blitz World Champion. In Dubai, Magnus Carlsen - the chess player who comes from another world - did it again: he won… and won. Kasparov tweeted: "This is a little like winning tennis slams on clay, grass and hard court". During the press conference, Anastasiya Karlovich asked Magnus: now you are World Champion in every Time Control, what can you do more in chess? And Magnus, with his typical grin, replied: "Well, I can do it again!" This spirit is typical of Carlsen, which may provide the key element to explain why this Norwegian young man is dominating the chess scene. Another journalist asked Magnus which Time Control he does prefer, and the Champion, very diplomatically, said he likes everything - but not Bullet or Correspondence chess: "I don't have the patience to play Correspondence chess, nor the fast hand you need to play Bullet". In a recent interview by Dirk Jan ten Geuzendam for New In Chess, right after the Gashimov Memorial, Numero Uno said: "every game should be an event". And when Magnus sits at the board, it is always exactly that: an exciting event. The Rapid Championship saw Fabiano Caruana win Silver. with Vishy Anand's winning Bronze; in Blitz Ian Nepomniachtchi got Silver and Hikaru Nakamura Bronze. 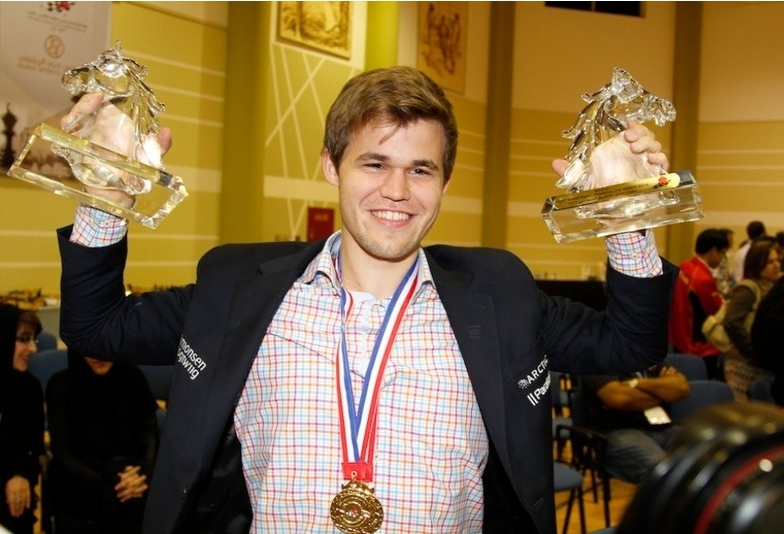 After the tournament, Carlsen sports a shiny - and impressive - 2948 Blitz rating. Games in PGN format: Blitz - Rapid. It was a 5-day chess marathon, with players from all over the World competing for the Rapid and Blitz titles; hundreds of games played at an amazing pace. ICC relayed live all the available games, for the enjoyment of its members. Congratulations to the amazing Magnus Carlsen!